Personalised His and Hers Cotton bath towels a very personal and unique gift in warm berry red and soft white. 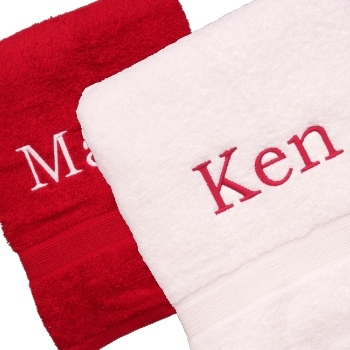 Personalised His and Hers Cotton bath towels a very personal and unique gift in warm berry red and soft white. Bath Towels 75x125cm. Treat a special person or a couple to a unique gift. Treat a special person or a couple to a unique gift. Popular for wedding or anniversary gifts and even a great housewarming gift. You can choose the option and have these towels made extra special -these can be personalised with your choice of embroidered text, including His and Hers, the couples names or initials monogrammed on each in coordinating thread. Comes with 1 dark berry red and 1 bright white towel very soft and very unique gift set!